$180 – plus $35 materials fee in cash (7weeks). 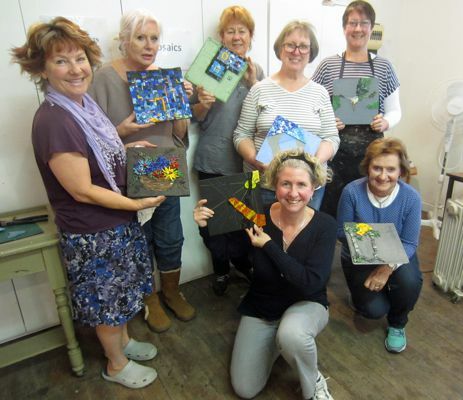 Come and learn mosaics for the first time or improve your existing skills. Adult class suitable for all levels. Each term we do a different technique. Students with mosaic experience are welcome to work on their own projects instead after consultation with Marian. Always wanted to make mosaic? Come and join internationally known artist and teacher Marian Shapiro. 7 x 3 hour sessions starting May 28th – July 9th. Marian has been working in mosaic since 2003 and has exhibited in many shows and has public and private commissions both nationally and internationally. She is a sought after teacher and speaker both in Australia and abroad. These classes run for 7 weeks each term and are suitable for all levels including complete beginners. If you’ve never made a mosaic before you can start off with a hanging piece or mirror to introduce as an introduction to this ancient art although I’m happy to discuss other projects. You will learn about materials, cutting, placing, adhesives and grout and the classes are supported by presentations and a large library of mosaic books which are available for loan to students between classes. Classes are capped at 11 people, so you get lots of individual attention. Anyone with mosaic experience or who has attended one of my classes before and wishes to do their own thing supported by me is also welcome. Have fun, learn a new skill and make a beautiful piece for your home or garden. There is a $30 per term materials fee payable to me, which covers the use of tools plus all the materials needed to make one mosaic project.